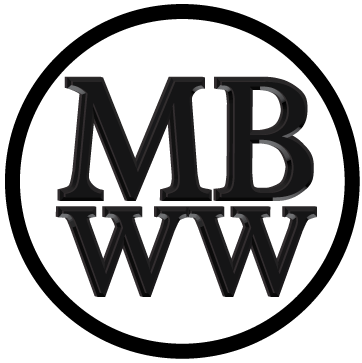 MORGENWERK M2-1 WATCH REVIEW - THE MOST ACCURATE AFFORDABLE WATCH IN THE WORLD? 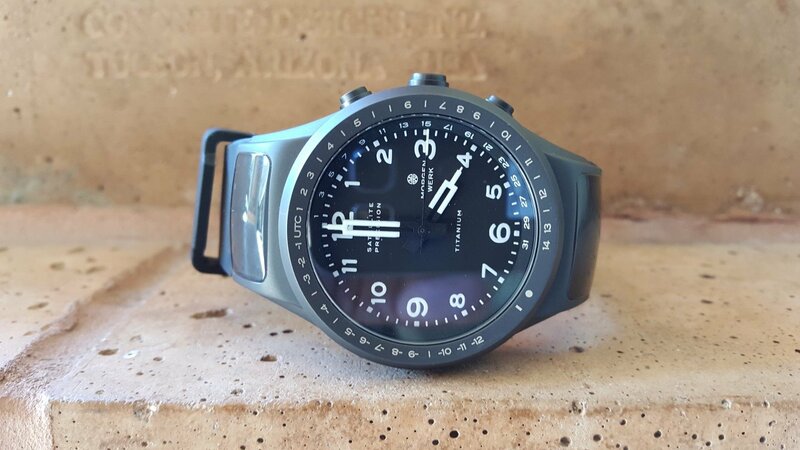 MORGENWERK M2-1 WATCH REVIEW – THE MOST ACCURATE AFFORDABLE WATCH IN THE WORLD? 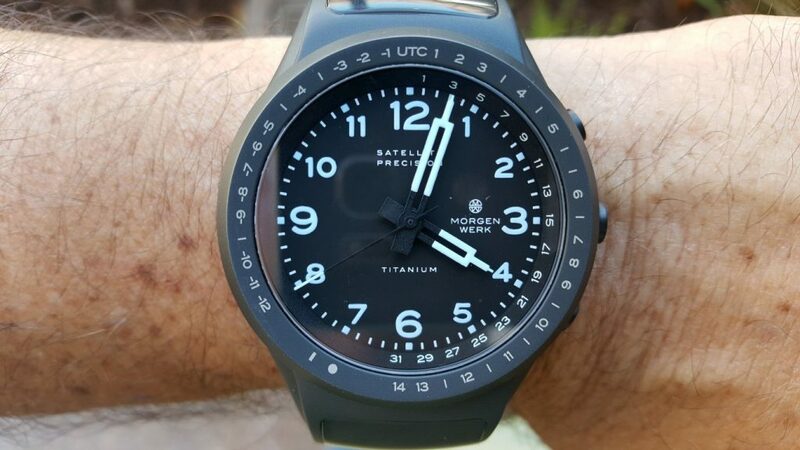 The second review in Bert’s series looks at the MORGENWERK M2-1 Watch, a satellite syncing, timezone adjusting marvel. MORGENWERK is a German watch brand that I never heard of until I was introduced to the company. The technology used in their timepieces is above and beyond anything else currently available on the market. In a nutshell, their watches, sync with atomic GPS satellites anywhere in the world. Combined with the watch’s thermo compensated quartz oscillator, software and microprocessor with corrective algorithms, these watches are capable of accuracy of +/-.75 seconds per year!!! I doubt there is any timepiece you can wear on your wrist with better accuracy. Currently the company offers seven models of watches using this incredible technology. Models include the M1-1, M1-2, M1-3, M2-1, M2-2, M2-X Perrarus and M3. The model that I am reviewing is the M2-1. This watch is midsize in their line and weighs 134 grams and is 46 x 15 mm. It has a water resistance rating of 50M or 5 bar. All M2 models use Arabic numerals, which on this model are white markings on a black face with black/white “empire state building” hour and minute hands and a simple black/white stick second hand. I have never seen hour and minute hands quite like these before, and they are perfect for this design. Superluminova is the lume of choice here, made from strontium aluminate that will glow all night long. It is neither radioactive nor toxic and stands out with a wonderful blue/green glow. The case and three pushers are made of sculptured titanium carbide coated 316L stainless steel, which offers excellent scratch and corrosion resistance. This surface coating achieves a 1000 HV (Vickers) hardness grade, which should maintain it’s finish indefinitely, except in extreme impact situations. Each watch lug has a hardened mineral glass panel for receiving satellite signals. These lugs curve as best they can to the contour of the case and the watch strap. Circling the bezel are all of the 39 time zones and daylight savings indicators. In addition, the outer edge of the watch face is marked for 31 days of the month. Once the watch is set up, you can access the date by pressing the 4 o’clock pusher. The second hand will then move to the correct date. Pressing the pusher again, returns the second hand to it’s exact correct location. Unlike normal analog watches, the minute hand stays exactly on the precise minute until the second hand passes the 12 o’clock position. In this manner, you always know the exact time without needing to resort to a digital watch display. The well integrated hex screw connected strap is made of fluorocarbon rubber, which is highly resistant to mineral oils, oil based lubricants, gasoline, diesel fuel, silicone oils and other lubes, including ozone. The strap has no noticeable odor and is expected to last indefinitely! The strap clasp appears to be made of the same titanium coated stainless steel as the case and it is nicely engraved with the MORGENWERK logo. The strap belt loop is designed to align perfectly with the end of the strap, so there is never any excess strap dangling around your wrist. A nice patterned surface on the inside of the strap helps keep the strap from sliding. MORGENWERK does offer an optional titanium link bracelet for 159 Euros. 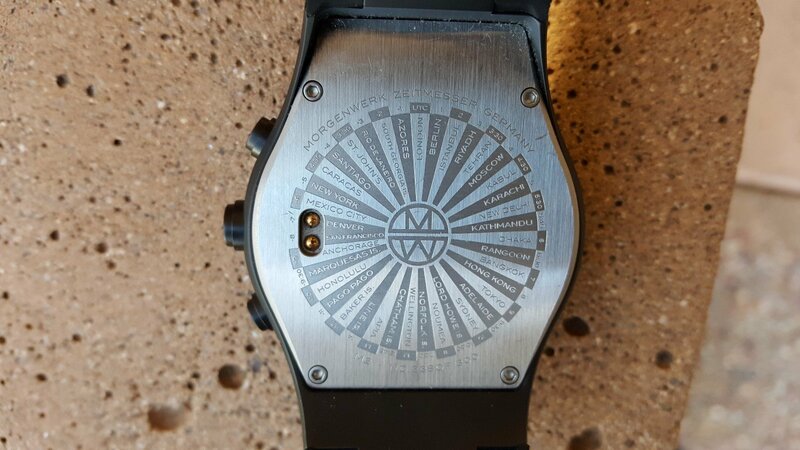 The stainless watch back is held in place with four small hex screws and it is engraved with all 39 time zones, the MORGENWERK logo, the company name, the watch model and it’s number. My example is number 238 of 300. 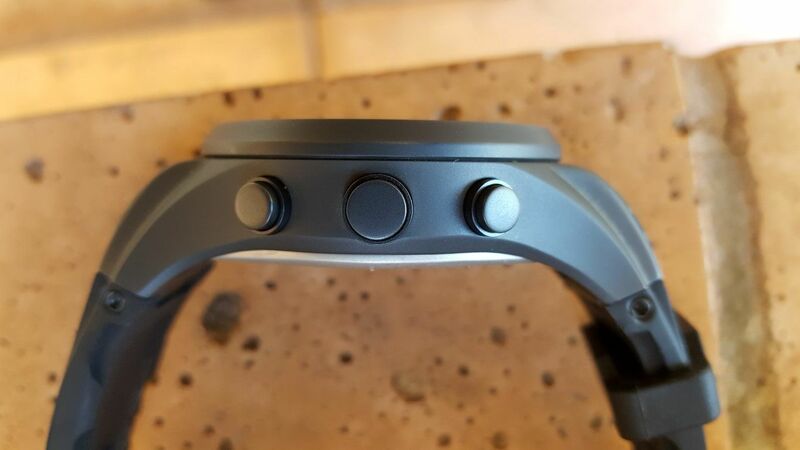 There are two recessed contacts on the back side opposite the 3 o’clock position which is where the the charging device docks with the watch. More about this later. When the watch is outdoors under an open sky, it will search for six satellites and it chooses three with the strongest signals. Syncing takes between 8 and 90 seconds. No manual setting of the watch is required or possible. The watch will adjust automatically for a leap second and it recognizes leap year for centuries to come! All 39 time zones are added or subtracted at the push of a button. The day of the month is accessed through the 4 o’clock pusher and the movement works bidirectionally. This is NOT a conventional analog watch in any way! Charging takes at most three hours and it will normally run up to three months through it’s lithium ion high capacity battery. MORGANEWERK states the battery is expected to last over 100 years! When in power saving mode, the watch can run up to 14 months on a single charge, with the second hand remaining stationery. When it needs a charge it tells you by the second hand jumping in five second increments. Charging is done via the docking fixture that plugs nicely into the back of the watch. The fixture is then plugged like a smart phone into a USB connector such as a computer or an AC adapter with the supplied USB cable. MORGENWERK makes it very clear on their website how this watch is engineered. The movement is made in house and is not available through any other watch manufacturer. The watch has extremely good shock resistance and uses a torque release system that prevents the need for unplanned repairs in case of accidents. 8 satellite syncs per year is all it takes for +/- .75 seconds yearly accuracy. Hopefully, this technology will allow MORGENWERK to expand further into other designs. I wish them well! 1400 Euros. morganwerk.watch.